The development of easel painting in 2007 is split in two directions. Pictorial approaches that were tried and tested in previous years are developed further in the first half of this year. 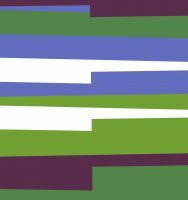 The parallelism of color stripes from 2004, now form the basis for a complex pictorial narrative. The quadratic repetitions of 2005 emerge in a more subtle and sophisticated application. In many cases, the squares are expanded into rectangles. In others, they merge with the structure of the colored stripes, leaving parts of their outlines behind. However, in each case, the squares manage to create a direction through their repetition that responds to other directions present in the picture. Hence even the parallelism of the squares become questionable. This is simply the formal aspect. The stripes and square forms are really only a color medium. Hence they are not really a square in the formal sense, but rather an organization and zoning of color. In the second half of 2007 a new treatment of the color stripes is applied. 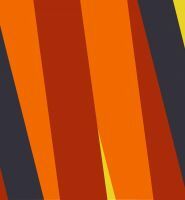 Colored stripes alternate rhythmically through a stripe structure. The stripes are often further supplemented by stripes of white. This system of alternating color stripes is set in contrast to another group of stripes within the picture producing opposing color tones within a similar pattern. This conflict creates in many cases a break in the picture; in others it produces connections and interactions. The confrontation with this picture theme is still in an initial phase.